It was a race against time when my husband, daughter and I loaded our car with boxes as news of the impending Hurricane Harvey began to flash in all media. We had travelled to Houston from Singapore to help our daughter move to her off-campus apartment at the University of Texas, Austin, located 265km from Houston. What we thought would be a leisurely three-hour drive had now become an urgent evacuation because all predictions pointed to an extremely damaging event and it was simply not advisable to be on the road when the hurricane made landfall. The city of Austin, being farther inland and at higher elevation, wasn't expected to be as severely impacted by the hurricane as Houston, which stood barely a few metres above sea level. On the previous evening, when my daughter and I made our way to H-E-B, the local supermarket, we had seen the longest snaking lines ever at the cashiers, with people's shopping carts full of bottled water, food, batteries and miscellaneous items that I examined closely just to be sure I had not overlooked anything essential. I ended up buying items of food that I rarely eat! We made it to Austin on time and went about setting up our daughter's apartment in the lashing rain, which stopped after a couple of days. But what we saw unfolding in Houston and coastal Texan cities on our TV set and mobile phones was a disaster that seemed straight out of documentaries on climate change, even though the hurricane was downgraded to a tropical storm. It was a strange feeling of deja vu as some of the words I had myself written in editorials over the years began to play in my mind. Memories floated in of the conferences which debated if the earth is going to warm by an average of 1.5 deg C or 4.5 deg C by the end of the century. I recalled the quibbling about the ppm (parts per million) of carbon dioxide, the millimetres of rainfall and the metres of sea-level rise. The fighting over how much of greenhouse gas emissions each country was entitled to. The endless debates on how economic growth would be hampered. Thoughts barged in about the ill-fated Titanic whose executives had agonised about their company's bottom lines even as the ship hurtled towards a killer iceberg. I know it is unwise to connect climate change to a specific hurricane. Storms have been happening and will always happen. But as experts have warned, global warming has made ever-increasing quantities of moisture available to storm systems, which in turn are making extreme rainfall events more intense and frequent. Harvey dropped an average year's worth of rainfall in just a few days. Had humans built well-drained habitations, all this stormwater would have moved away, but concrete cities like Houston that simply confine all the water make it go higher than it should and lead to situations where people drown inside their cars or need boats and helicopters in order to be rescued from their houses. I have seen terrible scenes of damage. The swirling waters made no distinction between beautiful homes decorated with classic furniture and homes of the poor. Roads became treacherous rivers and people were warned that floodwaters could be a mix of sewage and chemicals. Houston is said to average more than 800 sewage overflows in a year and badly needs to upgrade its pipes. In the suburbs of Houston, where plenty of land is available, one can see swales and permeable surfaces, which help to reduce and store run-off. These flood-management measures have been fairly effective against the increasing incidents of flash flooding in recent years and, in fact, without them the impact of Harvey would have been much worse. During the five years that I had once lived in Sugar Land, Texas, I often felt insecure about inhabiting a flimsy house made of wood and bricks, unlike the solid concrete houses I had been used to in India or the high-rise apartments of Singapore. It seemed to me that the houses in America were just not designed to adapt to the impact of climate change. Despite all the anxiety of my recent trip, I will remember Harvey for entirely something else - the heartwarming gestures of help that people and businesses extended towards one another. One mattress company unlocked its showroom for people who had to evacuate their houses. I lost count of friends who opened up their houses to shelter other families. Doctors, lawyers, engineers - everyone reached out to render services for free. My WhatsApp groups, which were once repositories of inane forwarded jokes, became centres of coordination on a war footing to help people in need. 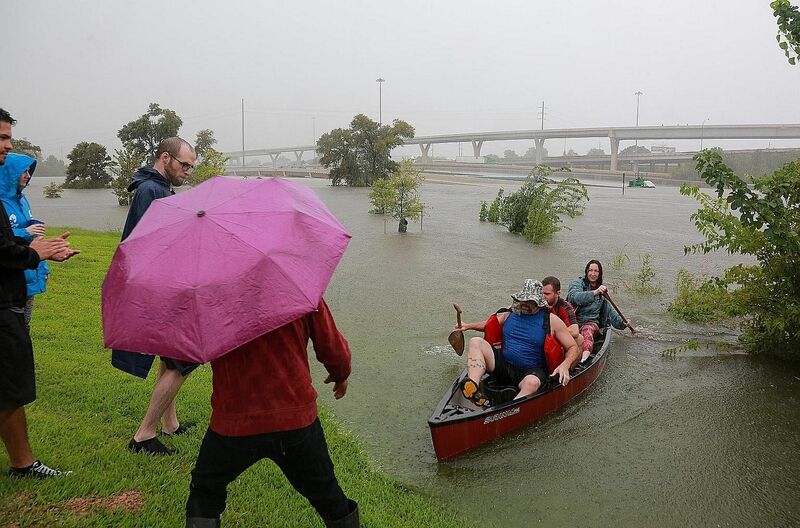 As an Indian, it made me proud that volunteers from organisations such as Hindu Swayamsevak Sangh, Sewa International, Hindus of Greater Houston and countless others went out in boats and high vehicles to offer every kind of support to people in the community. Even those who were rescued began to join efforts to rescue others. My favourite restaurants announced that all their dishes were available free to those whose supplies had run out. On an average day, every urban human lives on an island, caring only for individual needs. It took a flooding crisis to make those islands vanish and join the people into one interconnected, interdependent whole. I wish we had been this united to reduce the emissions that led to climate change. I wish we had been this cooperative while planning our urban spaces. •The writer is an author, environmentalist and commentator who specialises in water issues, Indic history and current affairs. She has recently published a book on the educational heritage of ancient India.